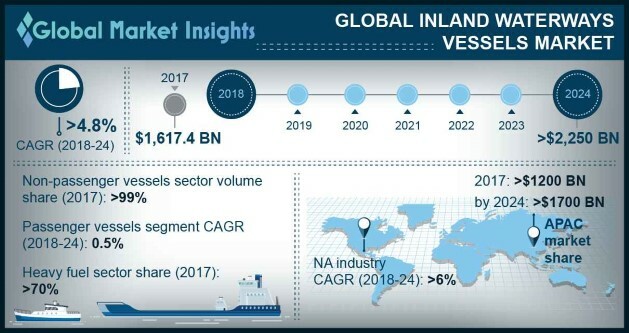 Global Inland Waterways Vessels Market size is estimated to surpass USD 2,250 billion by 2024; according to a new research report by Global Market Insights, Inc. Proliferating domestic trading activities across the globe through inland waterways is driving the global inland waterways vessels market share over the study timeframe. Increasing preference for these vessels can be attributed to the benefits offered including reliable transportation, cost effectiveness for transporting cargo over long distances, and congestion free movement over the other modes of transportation, are strengthening the market share till 2024. Non-passenger inland waterways vessel market will dominate the industry place with more than 84% revenue share by 2024. Increasing demand of cargo ships for transportation of agricultural products are boosting the segment share over the forecast timeframe. High adoption of general cargo and fishing vessels along with the increasing adoption of tugboats for proper movement and towing of ships will support the segment dominance. Passengers ship will grow significantly at approximately 6% CAGR till 2024. Increasing support from the government for enhancing the industry is playing a major role for inland waterways vessels market expansion till 2024. For instance, in 2018, Government of India approved USD 6.7 billion for leasing out cruises and promote cruise tourism providing a positive outlook for the industry growth. Industry players are continuously investing in R&D to increase the efficiency of inland waterways vessels and improve the safety significantly. The incorporation of multiple sensors and navigational systems enable easier and efficient movement of people and goods providing a positive outlook for the industry growth. The integration of double hulls systems to reduce spillage enable secured transportation of petroleum, further expanding the inland waterways vessels market revenue generation till 2024. Governments across the globe are introducing stringent regulations for improving the safety and reduce carbon emissions from the ships. Most governments are continuously supporting the upgradation and maintenance of the ports for improving the inland waterways vessels business. For instance, in 2018, Government of India approved USD 7.2 billion Jal Vikas Marg project for enhancing the navigation of inland waterways vessels on the Haldia-Varanasi stretch of National Waterway (NW-1), positively contributing to the growth of the inland waterways vessel market size in the country. However, the increasing cost of acquiring and maintaining ships along with varying climatic conditions may hamper the inland waterways vessels market growth till 2024. The increased delivery times along with stringent regulations for domestic trade via waterways and emissions concern may limit the business growth over the projected timeframe. High returns on investment from the inland waterways vessels will attract investments from service providers, providing a positive outlook for the market size expansion. Global inland waterways vessels market from heavy fuel oil will exhibit the maximum volume share of over 72% over the forecast timeframe. This dominance can be credited to the easier availability and increased usage of such fuels in multiple types of vessels. Low sulfur fuel oil will showcase over 10% CAGR over the forecast timeframe. This growth can be attributed to the benefits offered by the fuel including lower emissions and relatively clean burning compared to the other fuels. The compliance with stringent regulatory norms further supports the segment growth till 2024. Asia Pacific dominated the global inland waterways vessels market place with around 1,645 thousand units in 2017. This can be attributed to the improving water channels across the region. Supporting government initiatives along with increased investments to promote cruise tourism will further strengthen the regional dominance till 2024. Presence of multiple manufacturers including Sembcorp Marine, Samsung Heavy Industries, Wisdom Marine, Ilshin Shipping, and Hyundai Heavy Industries focus on introducing efficient inland vessels along with the proper integration of inland waterways transportation into inland transport and logistics network will further proliferate the business size. Sneed Shipbuilding, Sanmar, Bayliner, CMA CGM Group, and European Cruise Service are among the key players in the global inland waterways vessel market place. Other significant players include Windcat Work Boats, DFDS, Seacontractors, Norfolk Tug Company, and CIWTC. Industry participants are focused on expanding their portfolio for increasing their market share over the forecast timeframe. For instance, in 2018, Viking announced the launch of six cruises under its Viking Ocean division for felicitating passenger travel, providing a positive outlook for the industry growth.